Do you want some photos of my pelicans with the rack attachments. I dont think it would be hard to make the brackets you need for yours. You made brackets to mount them without racks? If that's the case, yes, show me!!! I'm finishing up the install of my Sam's Pelican-knockoffs and will post pics later. The boxes that Sam's currently sell are larger than the one's they use to offer for $19.95 (on sale), $24.95 regular price (I think). The one's selling now are larger and are $29.95, last time I was there. 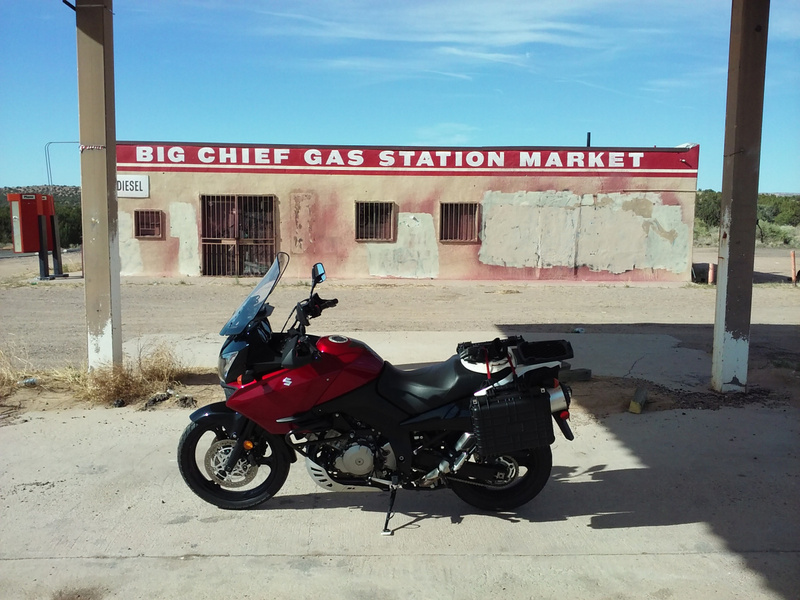 I considered them too large for my side panniers, so I stayed with the smaller units (I had already bought two when they came out a few years ago). Alittle history: before now, I used AMMO Cans for panniers........trimmed out much of the heavy steel on them, replaced with aluminum sides. I got the weights down from 22lbs to about 17lbs (each)........still too heavy for my likes. They held a ton of "schtuff" and were indestructible (and cheap, originally).....just too dang heavy. The smaller Sam's boxes weigh around 9-10 lbs each (if I remember correctly). Removing the carry handles and one side-latch deletes another 1 lb total. I don't need "quick-release" boxes. I have Happy-Trails 3/4" square rectangular rear racks, so I devised a mounting system (i.e. a bracket) to fit over the tops of both square bars (each side), and slide down....was not going to drill holes in my racks.......my pics will be worth a 1,000 words when I post them. I'm trimming away the rearmost "latch" mechanism and will mount a small plastic gas can in its place (for my Alaska Trip in May 2020), along with a bottle opener somewhere on the boxes.......and maybe a Helmet Hook. Also trimming the carry-handle mounting tabs......cutting them down flush with the top latches in case I need to tie-down a small bag resting on top of the boxes.....making the top as flat as possible. Stay tuned.......I'll post pics in a week or so of the Sam's boxes. Here's how I mounted mine, with a quick release system made from a Southco rotary latch (the kind they use on equipment cases): All the parts are made from aluminum angle, flat stock, ABS sheet plastic and a couple pieces of 18 Gauge sheet steel. The cases release by just turning the butterfly latch. 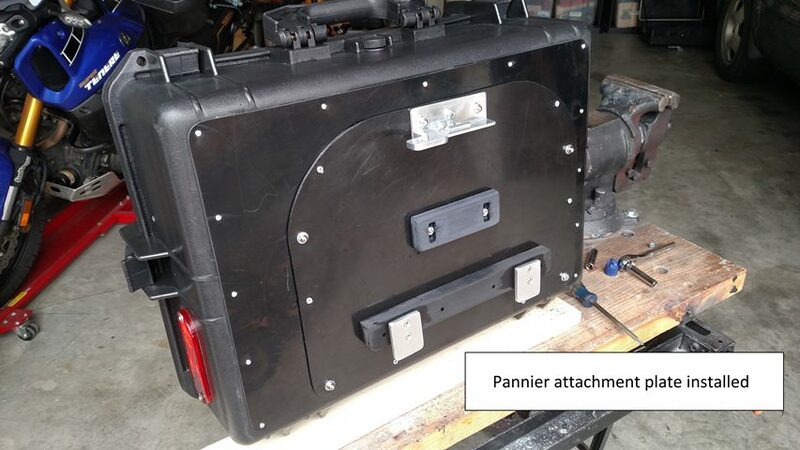 The locking pin is just a backup safety measure, plus you can put a padlock through the locking pin hole and lock the pannier to the racks. 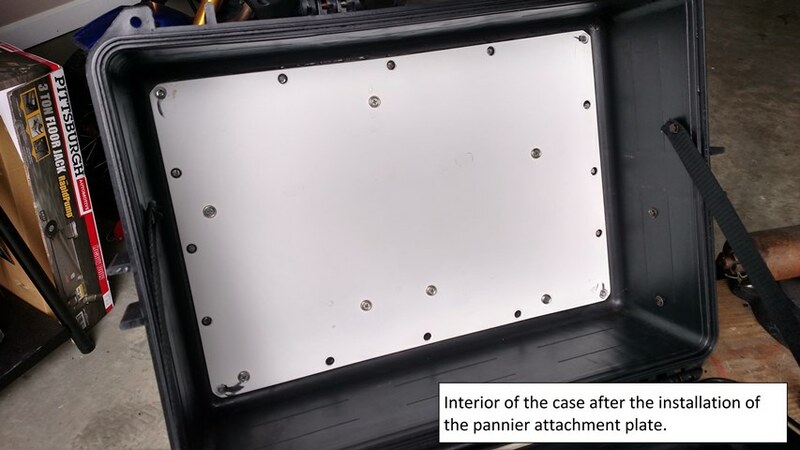 The attachment plate with all the components comes off, so it can be moved from one pannier to another without having to re-measure the position of all the components. Those Sam's Club cases look like the ones from MCM that were marketed under the name Duratool. I love them. There's at least 65 thousand miles on mine now, still going strong. Last edited by RCinNC; 12-17-2018 at 01:31 PM. Thanks Mark! It's about time I got the design right; this was my third version! I did something similar with some Harbor Freight cases. They're a little smaller, but they have some new ones about the size of yours. 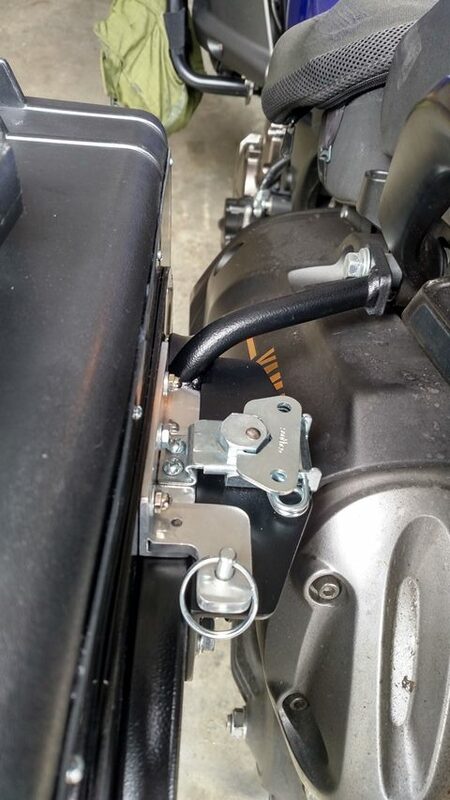 They're bolted to the Givi mounts, but they don't really get in the way of chain or brake maintenance. I later bought some Givi N22's, but took them off and put my Harbor Freight bags back on. They're so much more user-friendly. I'll have those N22s on the market before long.